Since 1953, Hammonds Furniture Store has proudly furnished the homes of hundreds of customers throughout Olean, NY and the surrounding areas. We offer a wide range of exquisite furnishing and décor at very reasonable prices. Whether you're in need of a new couch or dining table, you will find something that fits the look of your home, as well as your budget. We deliver to Olean NY and surrounding areas including Hinsdale, Salamanca, Bolivar, Cuba, Wellsville, Little Valley, Belmont, Franklinville, Saint Bonaventure, Allegany, and Arcade. We also deliver to surrounding towns in Pennsylvania including Eldred, Coudersport, Port Allegany, Shinglehouse, and Bradford. 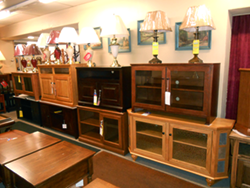 Stop by Hammonds Furniture Store during our business hours to take a look around our showroom. Our knowledgeable staff will discuss with you the great options we have for your home. We offer delivery and set-up on all of our products at fair prices. For those who need it, we offer financing services and layaway. Should you need to furnish your spare bedroom, living room, or your basement; we have something that you will truly love and help in giving your home the look you have been looking for. We are confident that our prices are the best in the area, and that you will leave knowing you got the best products money could buy. Thank you for visiting our website. If you have any questions about our products or services, feel free to contact us. We would love to help you!